A cross pattée (or "cross patty" or "cross Pate", known also as "cross formée/formy") is a type of cross which has arms narrow at the center, and often flared in a curve or straight line shape, to be broader at the perimeter. The form appears very early in medieval art, for example in a metalwork treasure binding given to Monza Cathedral by Queen Theodelinda (d. 628), and the 8th century lower cover of the Lindau Gospels in the Morgan Library. An early English example from the start of the age of heraldry proper (i.e. about 1200) is found in the arms of Baron Berkeley. Many crowns worn by monarchs have jewelled crosses pattée mounted atop the band. Most crowns possess at least four such crosses, from which the half arches rise. Some crowns are designed so that the half-arches can be detached, allowing the circlet to be worn separately on occasion. 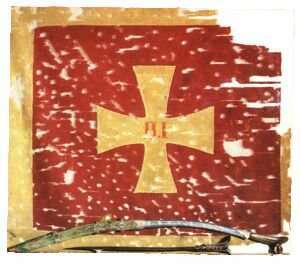 The cross pattée is sometimes associated with another Crusader order, the Knights Templar, though as with the Teutonic Knights, it was not used consistently. The Templars did adopt a red cross on their white robes in 1147, but there was no specific style designated, and different Templars used different versions of the cross. The cross pattée was by no means their official symbol. Some modern Freemason organizations do use the cross pattée in an official way, and this use occasionally causes confusion as to which version was used by the medieval order of Knights Templar . The Bolnisi cross (Georgian: ბოლნისის ჯვარი bolnisis ǰvari) is a cross symbol, taken from a 5th-century ornament at the Bolnisi Sioni church, which came to be used as one of the oldest national symbol of Georgia. 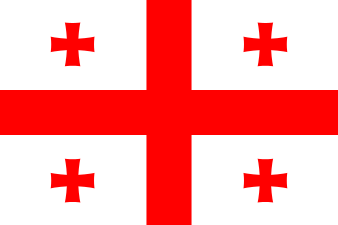 its is used on Flag and coat of arms of republic of Georgia and various organizations and administrative divisions within. Bolnisi Sioni inscriptions. Oldest Georgian inscription that uses Asomtavruli Alphabet, Predating the modern Mkhedruli alphabet, inside Georgia. The Montenegrin cross-flag (krstaš barjak) has been used in Montenegro since medieval times to represent the state, and lately its military divisions. The earliest documented use of this flag has been recorded in 1687. During the 1990s, it has been used as a symbol of Montenegrin independence movement, most notably by the Liberal Alliance of Montenegro. Nowadays, Montenegro's Royal Capital City Cetinje uses krstaš flag as its flag. It is also used as an unofficial alternate Montenegrin flag, as well as by local trademarks and societies related to Montenegro. F.C. Paços de Ferreira, a Portuguese football club. C.F. Os Belenenses, a Lisboeta football club. Casa Pia A.C., a Portuguese sports association. Mira Mar SC, a Portuguese football club. Flag of Asturias, a Spanish Principality. Toulouse FC, a French football club. Independent Truck Company, a manufacturer of skating equipment (in the alisée form, with the ends of the arms in the shape of arcs of an enclosing circle). The Crossmen Drum and Bugle Corps. Schneider Cams, a speed equipment manufacturer. Club de Regatas Vasco da Gama, a South African sports club. Club de Regatas Vasco da Gama, a Brazilian sports club. Neath RFC, a rugby team. 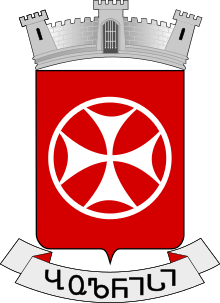 FC Volyn Lutsk, a Ukrainian football club. Derivatives of the cross pattée are popular amongst bikers, hot rodders and metalheads. In Unicode, a Cross pattée character is encoded under the name "Maltese Cross" in the Dingbats range at codepoint U+2720 (✠). ↑ Cetinje, Official website (English). "Symbols". Retrieved 18 April 2014.